[SatNews] Boaters who enjoy soccer but can't make it to the 2010 FIFA World Cup(tm) this summer cannow watch the games in 3D while on the water, thanks to the TracVision(r) HD7 from KVH Industries, Inc., (Nasdaq:KVHI). 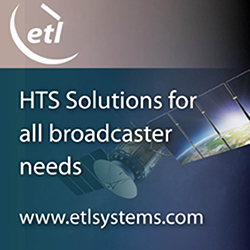 The new TracVision HD7 marine satellite TV antenna is fully compatible with broadcasts from the newest DIRECTV(r) satellite, which offers more than 200 HD channels and the world's first 3DSatTV channels, including broadcasts of World Cup matches in 3D. 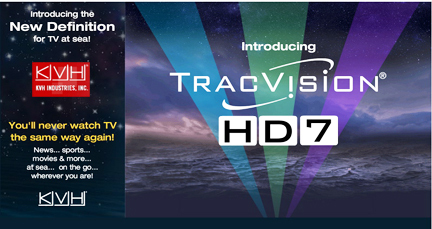 The TracVision HD7 features KVH's patent-pending TriAD(tm) antenna technology, which allows the antenna to receive signals from all three primary Ka-band and Ku-band DIRECTV satellites simultaneously, track those satellites even as the boat cruises at high speeds and through rough seas, and offer a DIRECTV HD experience just like at home. In addition, the TracVision HD7 includes an Internet Protocol (IP)-enabled antenna control unit (ACU) with a built-in Ethernet connection, WiFi interface, and USB port for easy setup, as well as a free iPhone(r) app that allows owners to check signal strength and switch satellites right from their iPhones! For boaters who plan to travel frequently among the Americas, KVH offers the Ka/Ku-band Tri-Americas(r) LNB for the TracVision HD7. This accessory allows TracVision HD7 owners to switch between DIRECTV and DIRECTV Latin America when travelling among ports in North America, the Caribbean, and Central and South America without having to change any antenna hardware!